How does design influence production at ebm-papst Inc.? An important part of ebm-papst Inc.’s business is our value-added assemblies. These assemblies are generally customer specific sheet metal enclosures that contain one or more ebm-papst air movers. 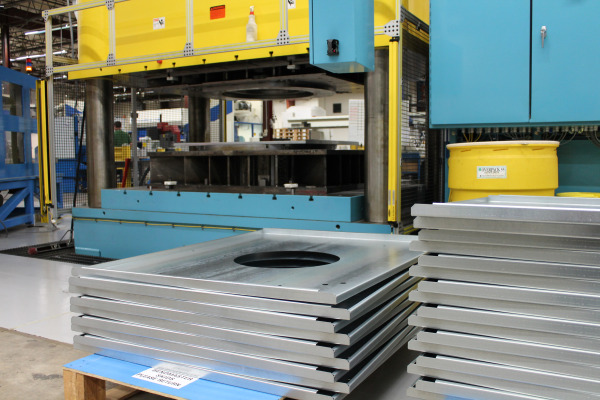 The development process for these assemblies is very much a collaborative effort between ebm-papst and our customer. Our goal is to create a cost-effective design that meets customer requirements and can be easily manufactured on our production floor. A critical phase in the development process is the initial design review. At this stage, a cross-functional team of engineers is assembled to evaluate the product and offer input into the design. We use historical knowledge from previous products to avoid design characteristics that may have caused issues in the past. Our philosophy is to avoid failures by designing them out. The product is modeled in Pro-Engineer which also allows us to get an idea of how easy the product will be to assemble. As the type of projects we work on has evolved, we have implemented Computational Fluid Dynamics simulations into the process to optimize the air flow path before making our first prototype. Despite all the planning in the development phase, input from the first prototype build will be used to tweak the design. Every product we build evolves throughout the life of the product. Our production staff that build the product day-in and day-out provide regular feedback on how to improve the design. Nothing replaces the feedback you get from the people that build the product. At the end of the day, there is a feeling of satisfaction you get from seeing a product being built 10 years after you worked on the project!